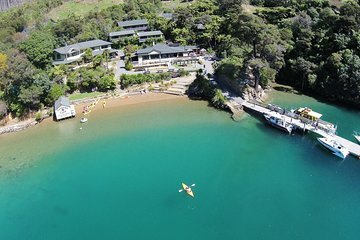 Lochmara Lodge is a luxury getaway nestled in the Queen Charlotte Sound, only accessible by water or by a few hours of hiking. Skip the sweating and the heavy backpacks with this short cruise from Picton across the Sound to Lochmara. Once there, you’re free to explore the Lodge and its surroundings at your own pace – there’s no itinerary or time limit. Walk through the forest, go kayaking in Lochmara Bay, enjoy lunch in the waterfront cafe or see the fish in the Lodge’s Underwater Observatory. Cnr Lambton Quay and Wellington Street. Easy walk from the Interislander ferry terminal.